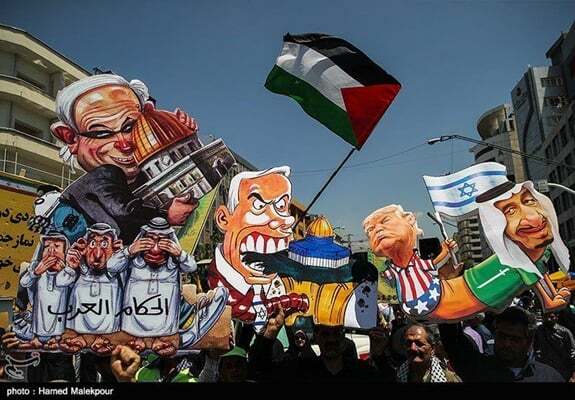 Fasting Muslims in Iran and other countries numbering in millions took to the streets on Friday to hold anti-Israel rallies, in a display of support for the cause of the oppressed people of Palestine, but the huge rallies did not receive the international coverage they deserved. Marking the international Quds Day, the marchers in thousands of cities across the globe chanted “death to Israel” and called for an end to the seven-decade occupation of Palestine. The demonstrators were honouring a long-established tradition going back to August 1979, when the late founder of Iran’s Islamic Republic issued a message to Muslims urging them to hold anti-Israeli rallies on the last Friday of the Muslim holy month of Ramadan. Since then, millions of demonstrators around the world take part in the annual event to express their protest against the Israeli occupation of al-Quds and its western backers enabling the decades-long suppression of Palestinians. This year’s rallies came at a particularly sensitive time, as Palestine is the scene of heightened tensions in the wake of a decision by US President Donald Trump to recognise al-Quds as the capital of Israel. The decision was followed by the relocation of the US embassy from Tel Aviv to al-Quds in mid-May. The US move, seen as part of preparations for implementing a so-called peace plan dubbed “The Deal of the Century” and formulated by the Trump administration, prompted mass protest across the Muslim world and among Palestinians in Gaza and West Bank. Since late March, Palestinians have held regular marches up to the border fence separating Gaza and Israel, during which 115 protesters have so far been killed and over 3,800 have been wounded by Israeli gunfire. However, to no one’s surprise, the global event received little coverage by western mainstream media, who are notorious for their highly biased coverage of the Palestine conflict. There was scant footage of the rallies broadcast in the Western media, and even the limited news coverage devoted to the event was flawed. Once again, astute observers noticed how skillfully the western media frame subjects in a way that play into their governments’ agenda. A detailed look at the coverage of Western media, who celebrate themselves as the freest and fairest in the world, reveals an attempt to distort reality of the annual anti-Israeli protests and present misleading assertions to the reader as unchallenged facts. Playing down the biggest annual show of support for Palestinians by devoting limited coverage to it. Portraying al-Quds Day as an event exclusive to Shiite Iran and anti-Israel groups allied with the country. Creating a perception that the event is politically motivated and is an attempt by an Iran embroiled in a standoff with the West to advance its interests. To illustrate these points, this article examines coverage of the event by Reuters, Associated Press and AFP, known as the “Big Three” western news agencies, which serves as an interesting case study of how western media not only misrepresent the pro-Palestine event, but also act as a mouthpiece for the western governments. The British outlet Reuters refused to cover the event directly. The news agency just covered a speech by Iran’s Parliament Speaker Ali Larijani delivered after the al-Quds rallies at Tehran’s Friday Prayers ceremony. Surprisingly, Reuters has selected a relatively less important point of Larijani’s long speech, which was mainly focused on the Palestine conflict, for the title of its news piece. The article describes the al-Quds event as “Iran’s annual day of solidarity with the Palestinians” and says only “tens of thousands of Iranians” took part in this year’s rallies. 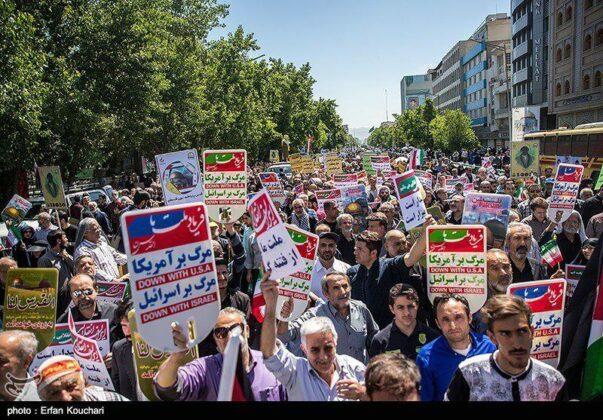 This is while the number of participants were certainly much more than that, as the demonstrations were held in Tehran and around 900 other Iranian cities across the 80-million country. Moreover, the al-Quds rallies were also held in many countries, including Pakistan, India, Afghanistan, Indonesia, Lebanon, Syria, Iraq, Bahrain, Malaysia, Turkey, Nigeria, South Africa, Yemen and Palestine. Similar rallies were also held in major western capitals, including London, Berlin and Washington, on Saturday and Sunday. The Reuters article refuses to go into details about the Palestine conflict, and instead draws a link between the event and problems between Iran and the west, including Iran’s nuclear program, Trump’s withdrawal from the 2015 nuclear accord and Tehran’s influence across the region. 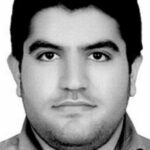 But one can hardly see a correlation between the event and disputes between Iran and the West. 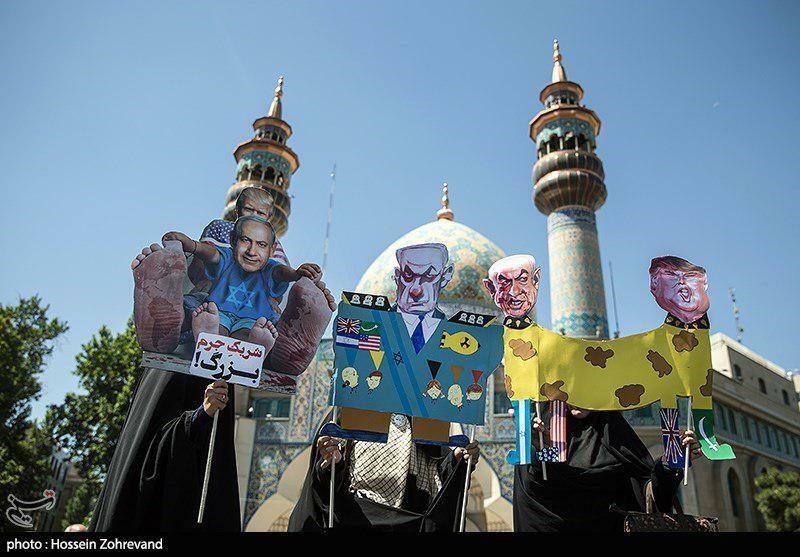 Iranian protestors did burn an effigy of Trump dressed in an Israeli flag, but it was in protest at Trump’s recognition of Muslims’ third holiest city (after Mecca and Medina) as the capital of Israel, not the controversial president’s tough line on Iran. As a matter of fact, anti-Israeli sentiments have been running high among Iranians since the formation of the Israeli regime in 1948. The hostility of Iran’s revolutionary leaders towards Israel has nothing to do with the US, as it could be traced to years before the revolution. Notably, Ayatollah Khomeini in a speech leading to the 1963 uprising against the US-backed Iranian regime criticized Shah Mohammad Reza Pahlavi for pressuring clergies not to speak against Israel in their sermons. “[They order us] not to talk about Israel and not to talk about Shah. What’s the connection between them? Is Shah an Israeli?” Imam Khomeini said. Since the Shah regime was toppled, Iran has been steadfast in its support for the Palestinian cause. According to Iran’s Constitution, Iranian governments are obliged to support the oppressed across the globe. Of note, Reuters has also distorted Larijani’s remarks, reporting as if Iran has threatened to move to destabilize the region. 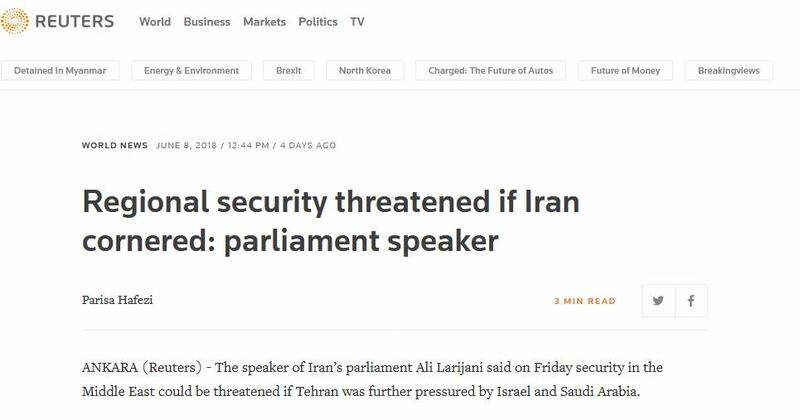 Reuters quotes Larijani as saying that “the region’s security will be threatened if they corner Tehran”, referring to the US, Israel and Saudi Arabia. This is while the Persian transcript of Larijani’s speech shows the Reuters’ translation has been inaccurate. “… the wicked triad of the US, Saudi and Israeli are trying to push Iran into a corner, but these amateur and sneaky creatures should be careful not to end up bringing themselves insecurity,” he said. The Associated Press has provided a broader coverage of the event, reporting al-Quds rallies in Syria, Iraq, Iran, Lebanon, Pakistan and Palestine. However, the reports are mainly focused on the role of anti-Israel resistance groups, which are mainly labeled by the western governments as terrorist. For example, in its Iraq report, AP says thousands of “Iran-backed militiamen” rallied in a main street of Baghdad in protest to Israel. In its Palestine reports, AP repeats several times that al-Quds Day protests in Gaza were organized by Hamas. By emphasizing the Shiite identity of those attending the rallies, AP seems to be trying to frame the event as a Shiite ceremony not welcomed by Sunnis. This is while the Palestine conflict has often served as a base for unity among Muslims, as supporting Palestine is a shared concern among Shiites and Sunnis. Interestingly, AP refers to the protests by the name “Jerusalem day”, perhaps to avoid legitimatizing the Palestinian’s claims over the city. AFP was also inaccurate in its portrayal of al-Quds Day. 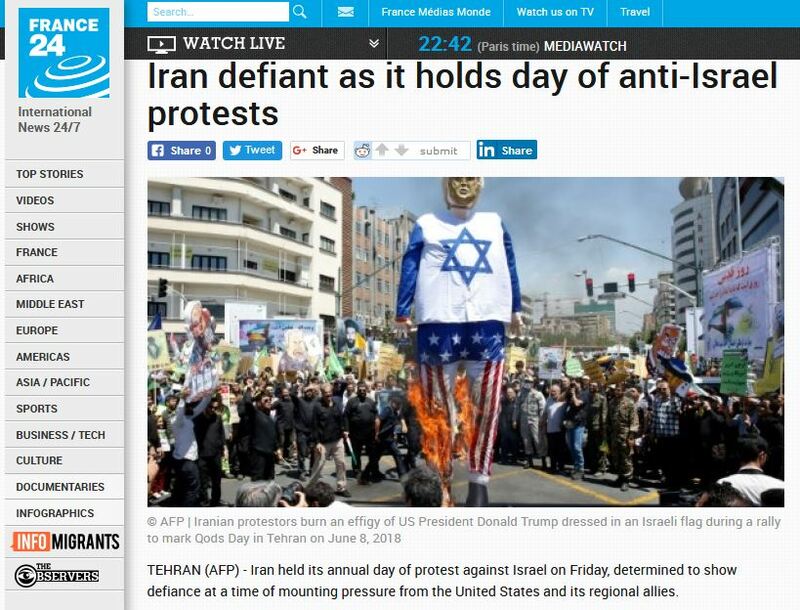 Reporting that “Iran held its annual day of protest against Israel”, AFP tried to limit the worldwide popularity of the international event. Mirroring Reuters’ narrative, AFP linked the event with Iran’s standoff with the west, saying holding the ceremony showed Iran’s “defiance at a time of mounting pressure from the United States and its regional allies”. To decode the western propaganda campaign on al-Quds Day, one only needs to look at Israel’s direct efforts to counter the demonstrations. Zionists have tried to curb the impact of the al-Quds Day demonstrations, and have even attempted to supress them if there was a chance to succeed. For example, pro-Israel groups have in recent weeks tried to prevent al-Quds rallies from being held in Berlin and London. But perhaps one of the most striking evidence useful for explaining western media’s approach toward al-Quds Day could be found in propaganda leaflets thrown into Gaza by the Israeli army last Thursday. The leaflets urged Palestinians not to join al-Quds rallies and not to let Hamas “to turn you into a tool to advance its narrow agenda”. Behind this agenda is “Shiite” Iran, which has made it its mission to “inflame tensions” in the region for the sake of its “religious and sectarian” interests, the leaflets said. 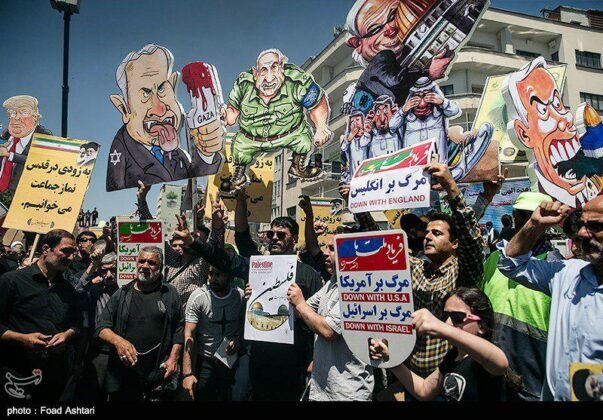 The narrative Israel is presenting in these leaflets appear to be in accordance with the propaganda ploy tried by western media: The event is organized by Iran and its allies, Iran is inflaming tensions in the region and It is merely seeking its own interests. It seems safe to conclude that Israel and its allied western governments are dissatisfied with the international al-Quds Day and are following a common formula to diminish its impact. This formula is centred on provoking divisions among Muslims and demonizing Iran, who enjoys growing popularity in the Arab streets of the region due to its honest, strong backing for the Palestinian cause. Seemingly, the Israeli regime is pinning hope on efforts to widen the Shiite-Sunni rift and separate Palestinians from their true supporters, among other measures. Will the Muslim world be vigilant enough not to fall in this trap? We hope so.